You are here: Home » National Pie Day! Attend a pie Festival! Attend the Great American Pie Festival in April at Lakeside Park in Celebration, FL. Eat Pie! Make it yourself, pick it up at the store, or order it for dessert. Any way you choose, eat some pie today. Make a pie! If you’re going to bake a pie, today’s the day! You can even combine this one with #3 to make the festivities that much yummier! Teach others how to make pie! If you don’t know how to make it, find someone who does and learn. Or, simply call Crisco’s very own Pie Hotline (1-877-FOR PIE TIPS) to speak with a live pie expert, and ask any pie question you can think of! Have a pie-making contest! Invite the best bakers you know to compete for prizes. Have cooking teachers, pastry chefs and other pie lovers to be the judges and give scores based on texture, taste, and overall quality. Share a pie! Whether it’s homemade or store-bought, share a slice with a neighbor or friend. Have pie night! Celebrate the miracle that is pie amongst family and friends. Give a pie! Have a charity contest for pie eating (or throwing) and donate the proceeds to your favorite food-based charity. Sample some pie! Pie retailers can introduce customers to pie through special sales and promotions this National Pie Day. Restaurants can offer a pie sampler plate or a free pie with dinner. Hold pie activities! Stage some activities for kids including pie-making, poetry and art contests. 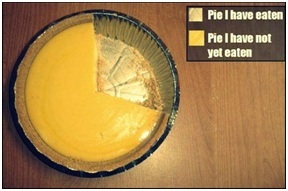 Teach math, science and world history through pie (this one is probably easier for math with pie graphs). Remember pie! Call older members of the family and ask them to give you some pie recipes. Talk about your favorite pies and your favorite memories associated with them. Do pie things! Sing pie songs, read pie poems and books, and make some pie graphs. What’s your favorite type of pie? Do you like it a la mode or just by itself? Leave us a comment below and tell us all about it!